Obstructive sleep apnoea is a common and serious breathing problem that is caused by effects of sleep on pharyngeal muscle tone in individuals with narrow upper airways. There has been increasing focus on delineating the brain mechanisms that modulate pharyngeal muscle activity in the awake and asleep states in order to understand the pathogenesis of obstructive apnoeas and to develop novel neurochemical treatments. Although initial clinical studies have met with only limited success, it is proposed that more rational and realistic approaches may be devised for neurochemical modulation of pharyngeal muscle tone as the relevant neurotransmitters and receptors that are involved in sleep-dependent modulation are identified following basic experiments. Obstructive sleep apnoea (OSA) is a serious breathing problem that affects approximately 4% of adults . OSA is associated with increased risk for adverse cardiovascular events such as angina, myocardial infarction, stroke and daytime hypertension. It also has adverse effects on sleep regulation, producing excessive daytime sleepiness, impaired work performance and increased risk for vehicular accidents , and impaired ventilatory and arousal responses to hypoxia and hypercapnia . Overall, OSA is a significant public health problem, with adverse clinical, social and economic consequences. A detailed critique and comparison of current treatments for OSA is outside the scope of the present review, but both surgical and nonsurgical approaches (e.g. continuous positive airway pressure [CPAP], oral appliances and weight loss) all have some success in reducing the severity of OSA . With the exception of CPAP, however, no current treatment is able to abolish apnoea effectively across all sleep states, and some treatments have only minimal effects. Nevertheless, although CPAP at appropriate pressure is effective in abolishing apnoea, patient compliance is a serious problem and impaired daytime function returns after missing only one night of treatment . Suppression of pharyngeal muscle activity in sleep is critical to OSA by producing a narrower airspace that is more vulnerable to collapse on inspiration . Anatomical factors that result in a narrowed upper airspace (e.g. pharyngeal fat deposition, hypertrophied adenoids and tonsils, retrognathia, micrognathia, macroglossia) predispose to OSA by reducing the critical pressure that is needed for suction collapse. Likewise, changes in respiratory control system stability and decreased lung volume in sleep may also play a role in OSA. Notwithstanding the importance of such factors in predisposing to OSA, it is important to emphasize that, regardless of the features an individual patient may have that predispose to OSA, the upper airway still remains open in wakefulness and closes only in sleep. This simplistic, yet important, observation highlights a crucial feature relevant to this review, namely that OSA is a disorder dependent on sleep mechanisms because occlusions occur only in sleep. By extension, even in individuals with structural narrowing of the upper airway, OSA is ultimately caused by the impact of brain sleep mechanisms on the processes that control motor outflow to the pharyngeal muscles, the tone of which is necessary and sufficient to keep the airspace open during wakefulness. The asphyxic stimuli and suction pressures generated during airway obstruction in sleep do not activate the pharyngeal muscles sufficiently to relieve the obstruction if the patient does not arouse from sleep , further highlighting the significant role of sleep mechanisms in OSA. Importantly, OSA patients also exhibit increased genioglossus (GG) muscle activity during wakefulness, suggesting the presence of a neuromuscular compensatory mechanism that prevents upper airway collapse in those individuals with narrowed airways . Although the mechanisms producing this compensatory increase in pharyngeal muscle activity in OSA patients are unknown, it is significant that this compensatory reflex is present in wakefulness and its withdrawal in sleep precipitates OSA. In order to understand the pathogenesis of OSA, it is important to identify the mechanism(s) that underlie the 'wakefulness stimulus' to the pharyngeal dilator muscles. Specifically, it is necessary to identify the neurochemical basis of the effects of sleep and wakefulness on both pharyngeal muscle tone and reflex responses, and especially the mechanisms that underlie the sleep-dependent loss of the neuromuscular compensation for the narrowed airspace (Fig. 1). Identifying the neural substrate(s) for the wakefulness stimulus for pharyngeal motor neurones, and preventing loss of this stimulus in sleep, may theoretically lead to prevention of the critical reduction in pharyngeal dilator muscle activity that ultimately precipitates OSA. Neurotransmitters of currently unknown identities (labelled '?') 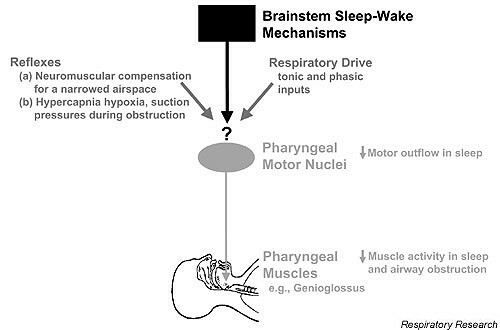 are responsible for the influence of sleep/awake neuronal mechanisms on pharyngeal muscle activity via their effects on motor neurone activity and reflex responses. Identifying these neurotransmitters, which may be different between non-REM and REM sleep, and their corresponding receptors will help in understanding the pathogenesis of obstructive apnoeas by explaining the modulation of respiratory and reflex inputs that underlies reduced pharyngeal muscle activity in sleep, thereby precipitating airway obstructions in susceptible individuals. The following text summarizes some of the brainstem mechanisms that may be involved in modulating pharyngeal muscle activity during sleep and awake states, and that may represent potential therapeutic targets in OSA. The discussion does not focus on the general field of pharmacological interventions in OSA (e.g. use of protriptyline, progesterone, theophylline, acetazolamide; for overview see ), but for the reasons discussed above it is restricted to influences of sleep-state dependent neural systems. Figure 2 shows potential interactions between neuronal groups that are involved in sleep/awake regulation and motor neurone activity. Evidence for and against the involvement of these mechanisms in control of the hypoglossal motor neurones that innervate the GG muscle is presented below, and implications for potential treatments for OSA are highlighted. The hypoglossal motor nucleus is the focus of the present review because the GG muscle is an important pharyngeal dilator muscle, and loss of activity of this muscle during sleep, especially rapid eye movement (REM) sleep, contributes to the onset of airway narrowing and occlusion . Palatal muscles are also important, however, because the retropalatal airspace is a consistent site of closure in OSA . As such, data that identify differential neural control of the trigeminal motor nucleus in the sleep and awake states are also presented where appropriate. Schema of the neuronal circuitry that is currently believed to be involved in the pontine regulation of rapid eye movement (REM) sleep and generation of motor atonia. Decreased discharge in dorsal raphé and locus coeruleus complex neurons preceding and during REM sleep progressively disinhibits pontine cholinergic neurones of the laterodorsal and pedunculopontine tegmental nuclei (LDT/PPT) via withdrawal of serotonin (5-HT)-mediated and noradrenaline-mediated inhibitory inputs. Activation of these LDT/PPT neurones then leads to increased acetylcholine (ACh) release into the pontine reticular formation, resulting in activation of the neuronal systems that mediate ascending and descending signs of REM sleep (e.g. cortical desynchronization and motor atonia, respectively). Exogenous application of a cholinergic agonist (e.g. carbachol) by microinjection into the pontine reticular formation is used to mimic this process and trigger REM-like neural events in reduced preparations (e.g. anaesthetized or decerebrate animals). Postural motor atonia in REM sleep is produced by postsynaptic inhibition of motor neurones by γ-aminobutyric acid (GABA) and glycine. Neurones of the medullary reticular formation are thought to drive this inhibition, themselves being driven by neurones in the pontine reticular formation (the reticular structures are indicated by the boxes). Whether hypoglossal (XII) motor neurones are also postsynaptically inhibited in REM sleep by similar mechanisms is uncertain. Hypoglossal motor neurones also receive excitatory inputs from the locus coeruleus complex and medullary raphé that may also contribute to reduced genioglossus muscle activity in sleep, especially REM sleep. Corelease of thyrotropin-releasing hormone (TRH) and substance P from raphé neurones may contribute to this process. The influences of other neural systems that are potentially modulated by sleep states are not included for clarity. See text for more details. +, excitation; -, inhibition; M, muscarinic. It is also important to note that respiratory premotor neurones exert significant influence on hypoglossal motor neurones, and these premotor neurones themselves are influenced by sleep mechanisms . Indeed, it is important to appreciate that total motor outflow to the GG muscle is the sum of the respiratory and nonrespiratory inputs to hypoglossal motor neurones. This concept is important because pharyngeal muscles typically show phasic inspiratory activity on a background of tonic activity that persists in expiration [11,12,13]. It is this prevailing tonic activity that is most suppressed in sleep [11,12,13], and this has major implications for airway collapse because a narrower airspace at end-expiration is particularly vulnerable to suction collapse on the next inspiration . Even though there may be only small changes in peak inspiratory GG muscle activity in the transition from wakefulness to sleep in normal persons [11,12], the withdrawal of background tonic activity may be the significant problem in predisposing individuals with already narrowed airspaces to OSA. Moreover, given the effects of sleep on pharyngeal reflex responses (see above), the withdrawal of pharyngeal muscle activity in sleep would be especially apparent in those OSA patients who exhibit increased GG muscle activity during wakefulness because of reflex neuromuscular compensation . Because sleep has dominant effects on the tonic drives to respiratory neurones and motor neurones [10,14], candidate neural systems that mediate these state-dependent tonic drives are now discussed. The pioneering work of Kubin and coworkers  has been instrumental in developing the concept that state-dependent modulation of serotonergic (i.e. 5-hydroxytryptamine [5-HT]) inputs to hypoglossal motor neurones may be importantly involved in changing GG muscle activity as a function of sleep/awake states. Medullary raphé neurones provide tonic 5-HT inputs to hypoglossal motor neurones . Medullary raphé neurones also exhibit discharge rates that decline from wakefulness to non-REM sleep, with minimal firing in REM . 5-HT depolarizes and increases the excitability of hypoglossal motor neurones in vitro  and excites hypoglossal motor neurones in decerebrate cats in vivo . The mRNAs for several 5-HT receptor types are present at the hypoglossal nucleus  and, of these, types 2A and 2C probably mediate the excitatory effects of 5-HT on hypoglossal motor neurones . In many medullary raphé neurones, both thyrotropin-releasing hormone (TRH) and substance P are colocalized with 5-HT, and these neurotransmitters are also excitatory to hypoglossal  and spinal motor neurones . Discharge of medullary raphé neurones that project to the hypoglossal motor nucleus is decreased in a pharmacological model of REM sleep that is evoked by carbachol microinjection into the pontine reticular formation of decerebrate cats . This pharmacological REM-like state is also associated with reduced 5-HT at the hypoglossal motor nucleus . Overall, these observations are consistent with the notion that increased raphé activity in wakefulness may increase motor outflow to the GG muscle via increased 5-HT at the hypoglossal motor nucleus, whereas withdrawal of 5-HT in sleep may decrease GG muscle activity . From the standpoint of basic neural connections and pharmacological effects of 5-HT, the above observations are compelling in suggesting a role for 5-HT in state-dependent modulation of GG muscle activity. Until recently, however, it had not been tested how 5-HT applied directly to the hypoglossal motor nucleus modulates GG activity in an intact, freely behaving (i.e. unrestrained) preparation. Accordingly, a new model was developed for in vivo microdialysis of the caudal medulla in freely behaving, naturally sleeping rats in order to modulate neurotransmission at the hypoglossal motor nucleus. In that model it was demonstrated that tonic GG muscle activation occurred when 5-HT was applied directly to the hypoglossal motor nucleus, and that the increased GG muscle activity was maintained for as long as 5-HT was applied (i.e. several hours) . This finding supports the basic concept that increased 5-HT at the hypoglossal motor nucleus acts as a 'wakefulness stimulus' to hypoglossal motor neurones to elicit increased GG muscle activity. Of importance, however, those studies in freely behaving rats also showed that the excitatory effects of 5-HT on GG muscle activity were significantly modulated by the prevailing sleep/awake state . For example, despite tonic stimulation by 5-HT delivered directly to the hypoglossal motor nucleus by microdialysis, periods of phasic GG suppression and even excitation occurred in REM sleep compared with non-REM sleep . This finding suggests that different neuronal mechanisms impact on hypoglossal motor neurones in REM sleep compared with non-REM sleep, and that REM neural mechanisms can overcome the tonic GG muscle stimulation provided by the locally applied 5-HT. The practical and clinical implications of this result are discussed below. Based on the overall premise that a sleep-dependent decline in 5-HT at the hypoglossal motor nucleus may decrease GG muscle activity , there have been several attempts to manipulate brain 5-HT levels in order to increase GG muscle activity as a potential therapy for OSA. Indeed, despite there being other candidate neurotransmitters that could also modify pharyngeal muscle tone across sleep/awake states (Fig. 2), 5-HT has received the most attention and accordingly is the primary focus of the present review. That 5-HT is worthy of this initial focus is exemplified by results showing that continuous delivery of 5-HT directly to the hypoglossal motor nucleus can selectively increase GG muscle activity for as long as the 5-HT is applied . Conversely, systemic administration of the 5-HT antagonist ritanserin, in order to simulate withdrawal of 5-HT in sleep, decreases pharyngeal dilator muscle activity, decreases airway size and increases sleep disordered breathing in bulldogs . There are several potential strategies by which to modulate pharyngeal muscle activity with serotonergic agents . Such strategies include application of selective serotonin reuptake inhibitors (SSRIs); of agents that increase 5-HT production or that reduce breakdown of 5-HT; of broad-spectrum 5-HT agonists; and of agonists that are specific for receptors identified on pharyngeal motor neurones . On the basis of this variety of options, it is still too early to determine the potential role of 5-HT as a future neuropharmacological therapy for OSA. This caution is necessary because the field is still in its relative infancy and because basic neural mechanisms and the appropriate receptor targets for 5-HT, as well as for other candidate neurotransmitters, still need to be identified. In addition, the combination of treatment strategies that is best suited to affect sleep-disordered breathing needs to be determined; this may be different for non-REM and REM sleep events, because the neurobiology of motor control is different between these two states [6,10,14]. With these caveats in mind, those studies that have attempted to modulate pharyngeal muscle activity or OSA using systemic approaches with 5-HT agents are discussed below. In normal persons, Sunderram et al. showed that the SSRI paroxetine both increased GG muscle activity per se and attenuated reflex GG muscle inhibition by positive airway pressure. This augmentation of GG muscle activity by paroxetine is consistent with the hypothesis of central stimulation of hypoglossal motor output by increased 5-HT . Moreover, the resistance of this raised GG activity to mechanoreflex inhibition has potential implications for preservation of reflex neuromuscular compensation previously identified as important in OSA (Fig. 1). It is noteworthy that augmentation of GG muscle activity by paroxetine was measured in wakefulness , at a time when SSRIs would be expected to exert their most pronounced effects because 5-HT raphé neurones are most active when awake . In sleep, however, when 5-HT neurones are less active, it may be expected that SSRIs would be less effective in increasing pharyngeal muscle activity because of reduced endogenous 5-HT. This may explain why SSRIs have only modest effects on sleep-disordered breathing in OSA [27,28,29]. For example, administration of fluoxetine  and paroxetine  resulted in statistically significant (but only modest) improvements in apnoea/hypopnoea index (AHI) in OSA patients (from 57 to 34 and from 25 to 18 per hour of sleep, respectively). In another study, however, night-time paroxetine caused no improvement in AHI , but all those patients had severe OSA (>60 events per hour). Nevertheless, even in the latter study there was increased peak inspiratory GG muscle activity for a given oesophageal pressure with paroxetine, which is consistent with potential stimulation of pharyngeal muscle activity by 5-HT . Application of L-tryptophan, a precursor of 5-HT that leads to increased 5-HT production, also produces modest improvements in AHI in humans . This was especially the case in a canine model of OSA when combined with trazodone, the metabolite of which (meta-[chlorophenyl]piperazine) is a 5-HT2A,2C receptor agonist . In humans the safety of L-tryptophan loading has recently been questioned because of its association with eosinophilia/myalgia syndrome . Data also suggest that the beneficial effects of SSRIs on sleep-disordered breathing are most pronounced in non-REM sleep, with little or no change in REM events [27,28]. This difference between non-REM and REM sleep may be expected because 5-HT raphé neurones show minimal activity in REM , and hence SSRIs would be least effective in increasing 5-HT levels in that sleep state. Another potential reason for the minimal effect of SSRIs on REM events is that the neuronal processes that underlie generation of REM sleep itself may also recruit additional neuronal mechanisms that can overcome the excitatory stimulation of hypoglossal motor neurones by 5-HT. This effect may also explain why improvements in sleep-disordered breathing following L-tryptophan administration were also most pronounced in those individuals with events that predominantly occurred during non-REM sleep . In support of this scenario, when 5-HT is applied directly to the hypoglossal motor nucleus by in vivo microdialysis to produce tonic GG muscle stimulation in naturally sleeping animals, REM sleep is associated with periods of significant phasic suppression of GG muscle activity that can overcome this 5-HT mediated excitation . Likewise, in a canine model of obstructive apnoea, combined treatment with L-tryptophan and trazodone reduced the number of sleep-disordered breathing events, but was unable to prevent the persistent suppression of pharyngeal dilator muscle activity that occurs during the transition from non-REM to REM sleep . The neural mechanisms that mediate such persistent suppression of GG muscle activity in REM sleep, despite excitatory stimulation of the hypoglossal motor nucleus, have not been determined, and inhibitory or disfacilitatory mechanisms may each play a role to a greater or lesser degree. Further withdrawal of endogenous excitatory neurotransmitters in the transition from non-REM to REM sleep (e.g. 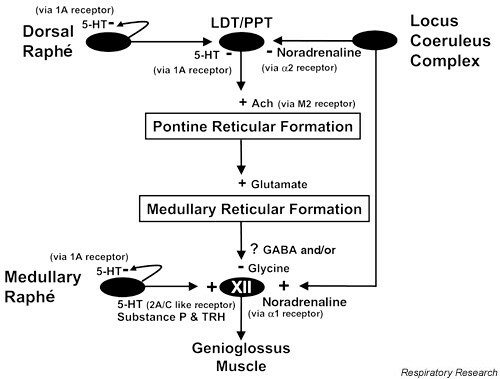 5-HT with coreleased TRH and substance P  and noradrenaline ) would promote further disfacilitation of hypoglossal motor output to GG muscle. The potential role of inhibitory mechanisms is discussed below (see Inhibitory neurotransmitters: γ-aminobutyric acid and glycine). The success of future studies in OSA with agents to increase central 5-HT levels will rely on the ability to target selectively the relevant neural systems and 5-HT receptors on pharyngeal motor neurones. Although this aim is feasible in animal preparations with local delivery of agents to pharyngeal motor nuclei using anatomical approaches , the use of systemic approaches in intact humans will pose a significant challenge. In practice, it will be difficult to target selectively the postsynaptic 5-HT neuronal elements on the relevant pharyngeal motor nuclei while avoiding the presynaptic and autoreceptor elements that, in some cases, can suppress motor outflow. 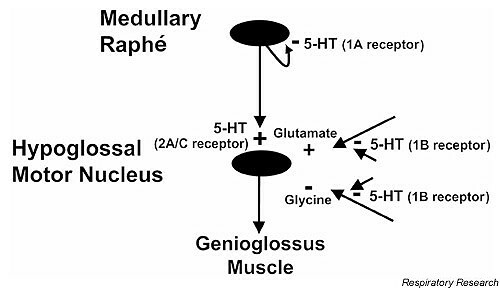 For example, although excitatory 5-HT inputs to the hypoglossal motor nucleus stimulate GG muscle activity [14,17,18,23], the caudal raphé neurones that provide these inputs possess axon collaterals that self-inhibit raphé neurones via the 5-HT1A autoreceptor . Accordingly, attempts to increase 5-HT in the central nervous system via pharmacological approaches, with the aim of increasing pharyngeal motor outflow, should be careful to avoid such inhibitory effects on endogenous 5-HT drives to the hypoglossal motor nucleus. Likewise, although the excitatory effects of 5-HT at the hypoglossal motor nucleus have been emphasized, presynaptic 5-HT1B receptors can inhibit excitatory glutamatergic  and inhibitory glycinergic  inputs to hypoglossal motor neurones. This differential modulation of hypoglossal motor outflow by 5-HT (i.e. excitation versus suppression) may be involved in switching motor output appropriate for specific behaviours (e.g. respiration versus mastication, suckling or swallowing) . At the very least, however, these results complicate the simple expectation that 5-HT merely excites tonic hypoglossal motor outflow to the GG muscle. This issue is relevant because in newborn rats 5-HT can suppress hypoglossal motor activity  and systemic administration of ondansetron, a 5-HT3 receptor antagonist, can even reduce sleep-disordered breathing in adult bulldogs . The latter result is complicated, however, and may not be due to direct effects of this agent at the hypoglossal motor nucleus because, at least in the rat, there is no effect of 5-HT3 receptor stimulation at this site . The potential for different 5-HT receptors to exert differential modulation of hypoglossal motor neurones is shown in Figure 3. The aforementioned differential facilitation of phasic respiratory versus tonic nonrespiratory inputs to pharyngeal motor neurones by 5-HT  is relevant because it relates to the maintenance of airway patency (see above) and implies that 5-HT mediated effects may even be dose dependent. Moreover, 5-HT is ubiquitous in the central nervous system, and selective interventions to increase pharyngeal muscle activity will probably prove difficult without affecting other major behavioural systems (e.g. sleep, mood, etc.) or even respiratory pump muscle activity . This is of concern for OSA because costimulation of the respiratory pump muscles by pharmacological interventions may offset the potential beneficial effects of pharyngeal muscle activation. In contrast, potential coacti-vation of tongue protruders and retractors by pharmacological interventions may be beneficial for OSA, because this coactivation improves upper airway stability . The potential for different serotonin (5-hydroxytryptamine [5-HT]) receptors that act at different sites to modulate hypoglossal motor neurone activity. In addition, modulation of 5-HT1A autoreceptors on dorsal raphe neurones may also indirectly affect hypoglossal motor neurones via effects on rapid eye movement sleep (Fig. 2). See text for more details. +, excitation; -, inhibition. Thus far the present review has focused on 5-HT as a potential modulator of pharyngeal muscle activity across sleep/awake states. Other state-dependent neurotransmitters may also be involved, however, but those neural systems have not been explored to the same extent as 5-HT. Some of those other candidate neuronal systems are considered in the following sections, although not all potential candidates are discussed (e.g. acetylcholine) because the literature linking them and the control of pharyngeal motor output by sleep mechanisms is currently lacking. Like raphé neurones, noradrenergic neurones of the locus coeruleus complex show state-dependent activity; discharge rates decline from waking to non-REM sleep, with minimal firing in REM . Those neurones project widely throughout the central nervous system and enhance synaptic transmission at their target sites. In vitro studies  have shown that noradrenaline depolarizes and increases excitability of hypoglossal motor neurones via α1-adrenoreceptors. Thus, there is appropriate circuitry by which sleep-related decreases in the activity of noradrenergic neurones may contribute to sleep-related decreases in the excitation of pharyngeal motor neurones. Unlike for 5-HT, however, there is a relative paucity of data regarding the potential role of noradrenaline in the control of pharyngeal muscles and the relevance to OSA. TRH is colocalized with 5-HT in many medullary raphé neurones, and this peptide is also excitatory to hypoglossal motor neurones . Consequently, withdrawal of TRH in sleep, especially REM sleep, may also contribute to decreased pharyngeal muscle activity and reflex responses (Fig. 2). TRH analogues with little endocrine activity are of intriguing potential as an aid to increase motor activity. Indeed, even several years ago TRH and its analogues were shown to be beneficial in motor disorders that involve spinal dysfunction (e.g. spasticity produced by spinal trauma) . However, I am unaware of any full studies that assessed the potential impact of modulating TRH on pharyngeal muscle activity or OSA. Of relevance, the increased motor neurone excitability produced after systemic administration of a TRH analogue in rats is potentiated by coadministration of a 5-HT agonist . Substance P is also colocalized with 5-HT and TRH in many medullary raphé neurons and excites motor neurones ; therefore, its withdrawal in sleep may contribute to suppressed motor activity and reflex responses. Modulation of substance P, however, is unlikely to be useful in augmenting GG muscle activity, given the involvement of this transmitter in modulation of sensory pathways such as pain. Postsynaptic inhibitory mechanisms play a role in hypotonia of postural (lumbar) and trigeminal motor neurones both in natural REM sleep and in the REM-like state produced by pontine carbachol [43,44]. However, whether such inhibitory mechanisms contribute to suppression of hypoglossal motor output to GG muscle in REM sleep is uncertain, on the basis of studies in decerebrate or anaesthetized animals following carbachol administration [45,46]. However, pontine carbachol does not reproduce the whole range of electrocortical and respiratory changes that is elicited in natural REM sleep, particularly phasic events [14,47], which may be involved in transient inhibitions of hypoglossal motor output . Accordingly, whether inhibitory mechanisms are recruited in natural REM sleep to suppress hypoglossal motor activity is controversial. As with other motor neurones, however, the neural circuitry suggests that there is the potential for hypoglossal motor neurones to be affected by postsynaptic inhibitory mechanisms. For example, inhibitory postsynaptic potentials sensitive to applied strychnine have been recorded in hypoglossal motor neurones [48,49]. Application of γ-aminobutyric acid (GABA) inhibits hypoglossal motor neurone activity via the GABAA receptor [48,49]. Of importance, GABA and glycine may be coreleased from the same presynaptic vesicle , and this could explain the major suppression of GG muscle activity in REM sleep  if both neural systems are recruited together. Whether recruitment of GABA and glycine systems occurs in REM sleep has not been determined for the hypoglossal motor nucleus, however, and this is an important question for future research. In this regard there is an interesting case report that describes an attempt to counteract putative glycinergic inhibition of pharyngeal motor neurones with systemically applied strychnine in a patient with OSA . In that study strychnine caused an increase in tensor palatini muscle activity; changes in GG muscle activity were less obvious, however, and non-REM and REM sleep were not distinguished . Again, as for transmitters other than 5-HT, there is a distinct lack of data regarding the potential role of inhibitory neurotransmitters in control of pharyngeal muscles and its relevance to OSA. There have been several previous attempts in humans to increase upper airway muscle tone and to alleviate obstructive apnoeas by neurochemical approaches, and a resurgence of interest in these approaches has occurred as knowledge of the neural systems that affect pharyngeal motor control increases. To date, however, these clinical studies have met with only limited success, in large part because the basic mechanisms that underlie suppression of upper airway muscle activity in natural sleep, and the neurotransmitters and receptor subtypes that are importantly involved, have not yet been fully determined. Once these neural systems and receptors have been identified and their relative importance determined, however, it is expected that more rational and systematic approaches can be devised for the systemic administration of drugs in order to centrally modulate motor output to the pharyngeal muscles. Indeed, as in other disciplines (e.g. the continuing development of drugs for asthma, heart disease, etc. ), an effective route for overcoming the many obstacles in this field will probably be forthcoming, especially after the basic physiological experiments guide the clinical and therapeutic approaches to target specific receptors. From a clinical perspective, the importance of understanding basic neural mechanisms of pharyngeal motor control, especially the differences in neurobiology between non-REM and REM sleep, cannot be emphasized enough, both in adequate interpretation of clinical data and in planning therapeutic interventions. For example, if progressive inhibition or absence of facilitation significantly contributes to further GG muscle suppression from non-REM to REM sleep, then a suitable combination of neuropharmacological agents may be more beneficial to maintaining pharyngeal muscle tone in REM sleep than modulating a single neurotransmitter that may only be effective in non-REM sleep. The implication of this consideration is that any potential therapy may have to be tailored to the individual patient, based on whether their sleep-disordered breathing predominates in non-REM and/or REM sleep. Accordingly, all studies investigating potential treatments for sleep-disordered breathing should rigorously control for such variables that influence OSA, such as sleep stage and even body position in which apnoeas occur. The author's work is supported by an Canadian Institutes of Health Research (CIHR) Operating Grant (15563), and development grants from the Canada Foundation for Innovation and the Ontario Research and Development Challenge Fund. The author is a recipient of a CIHR Scholarship.